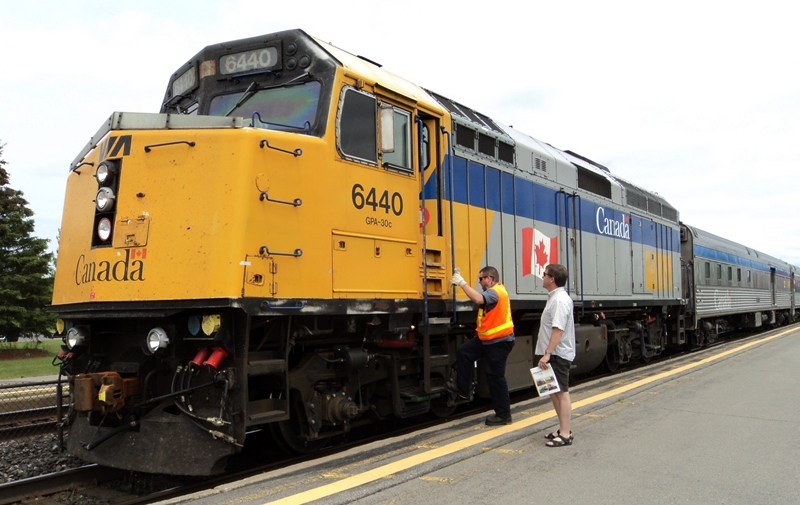 Jordan McCallum is a VIA Rail engineer who emailed me this week with what he termed a strange but fitting request. He wondered if I could deliver a copy of Trackside with VIA: The First 35 Years to VIA train 57, which Jordan would be one of the engineers on. Do fish swim? My wife and I arrived ahead of 57, which soon arrived on the south track. After Jordan headed back to ex-CP 8609 to handle the baggage, and brought a snack back to the cab of 6440, it was time to make the delivery as my wife snapped a few photos. Jordan, it was indeed a fitting way to deliver a copy of my book, especially to a VIA fan at Kingston, who is ALSO a VIA employee, who is ALSO operating a VIA train at the time.